We had a little free time this weekend. We were planning to go on the Peterson Butte hike; this mountain is in full view from our house, it’s open for a climb one day a year, and we have never actually made it. But heavy rain was forecast, and hiking in pouring rain didn’t sound that appealing. So, instead, we started shopping for turkey chicks; and we (well, I) happen to notice there were little goslings in at Wilco. And I’ve always kind of wanted a goose. And I’ve been reading about geese lately, since becoming such a fan of duck confit. And also, Jay is a very tolerant husband when it comes to adventures in farming. 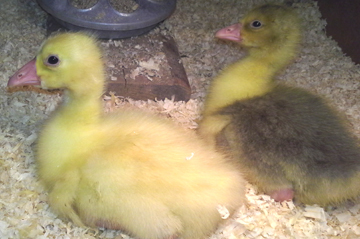 Sooooo the short story is we now have two little geese setup in a brooder in the greenhouse! They are actually literally under the grow lights, since the box with lights is setup under the table with the grow lights. We did also pick up a batch of turkeys, which are in a separate box… but they are boring. Baby geese look just like very large, homely ducklings. These goslings were “assorted”, so we don’t know what varieties they will turn out to be, and I haven’t been succesful in guessing. This is kind of a problem for me. However, there aren’t that many kinds of geese offered commercially, so hopefully it will become clear as they grow up. And if the confit thing turns out to be relevant, it won’t be a long-term problem. Geese are our first new (animal) species on the farm in almost a decade; the last one (hard to believe) was the dog in October of 2005. The last new proper farm animal was bees earlier in 2005. When we first got the farm, we (well, I) was so curious about new things and new animals… we got ducklings and goats the same week in 2002, which was a little much, and instituted a one-new-species-per-month limit. But there’s so much to do with these many kinds of animals, trying to keep yet more species happy has always seemed too much. We’ll see how the geese go, how different they are or if they are just like extra large ducks.